The Glamorous Life of a Housewife: It's Recipe Time! I am a bread girl. If there were an all-bread diet, I would be the first one on it and likely the spokesperson promoting it all over the world. Breads of any sort are a delicacy to my lips - sweet breads, savory breads, salty breads, doughy breads, crusty breads....I love it all! Husby, however, could really take or leave it. I prefer the rolls and biscuits to the actual meal which they accompany. Husby, of course, prefers the main course. 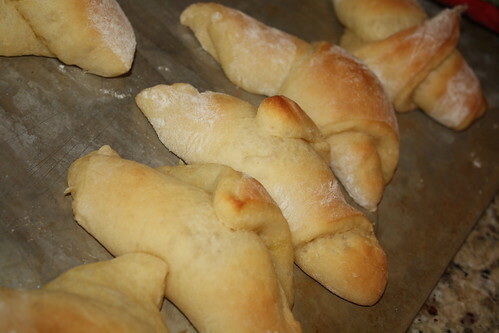 when it comes to these Crescent Rolls. Guys, I have never in my life seen my husband so crazy about bread. He will eat them until he can't possibly hold another bite and he will eat the leftovers for snacks. He is in love with the bread. It's THAT good. Make them and your life will be forever changed. And if you bring them to a party, you're sure to be the hit! *Combine potatoes, sugar and butter in large bowl. Add milk and cool to tepid. *Add yeast, eggs, 2 C. flour, salt, baking powder and soda. Mix well. *Gradually add 3 to 4 C. flour to make a medium soft dough. Knead a few minutes on floured surface. *Place in greased bowl, cover tightly and refrigerate for a few hours (or overnight). *Divide dough into 4 parts. *Roll each into a circle and spread liberally with soft butter. *Cut into 12 pie shaped wedges. *Roll from large end to point. *Place on greased baking sheet, cover with sprayed wax paper and let rise for 2 hours. *Bake 10-12 minutes at 400. They are really very simple to make. You can even eliminate the refrigeration part if needed and they will turn out just as tasty! Very interesting! I may give it a go since we do not have Pillsbury or crescent rolls in Australia. Those look AMAZING! 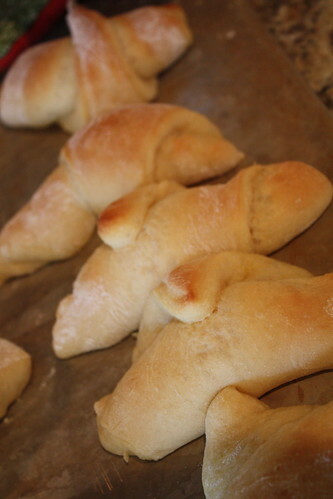 I'd definitely rather have a homemade one than some Pillsbury one from the store. YUM! Oh girl I feel you on the bread addicition. If I could live off of it, I would! I've even thought about moving to France because of the baguettes. So funny about your husband liking the crescent rolls, my husband likes the pillsbury kind, I'll have to try making the homemade version ;) Thanks! Oh my goodness I am a bread lover too. I have been known to get full off of bread before I get my meal. I especially LOVE the chedder biscuits from Red Lobster and the corn bread and rolls from Black Eyed Pea. Ok I have to stop...I'm hungry and now my mouth is watering ha-ha. I am going to go out and get these ingredients pronto! Can't wait to try it! Love bread, and MUST try these. My middle school french teacher taught us to put a square of Hershey's chocolate in the crescent roll before you rolled it up and baked it... OH completely indulgent and wonderful. These sound and look amazing! I have one question though...for the potatoes, do you use just the instant flakes or do you actually make the flakes into mashed potatoes before adding them to you mixture? I've made bread before that calls for just the flakes, but I've never seen one that calls for them to actually be mixed up into mashed potatoes. I'd really like to give these a try! I'm with you on the all bread diet. Sounds awesome! I'll definitely give those crescent rolls a try. They look so tasty. I'm intrigued by the addition of mashed potatoes - potatoes make everything better, so why not?!? Thanks for sharing. An all-bread diet sounds heavenly! mashed potatoes, huh? they look good, but i agree, strange! i might just have to try! I LOVE breads. I probably ate no less than 4 chocolate croissants at our resort each day at breakfast. I starred this in reader so I can make it soon. I had pinned this post so I could try these - I just made them this morning and they are delicious! Thanks for sharing your recipe!